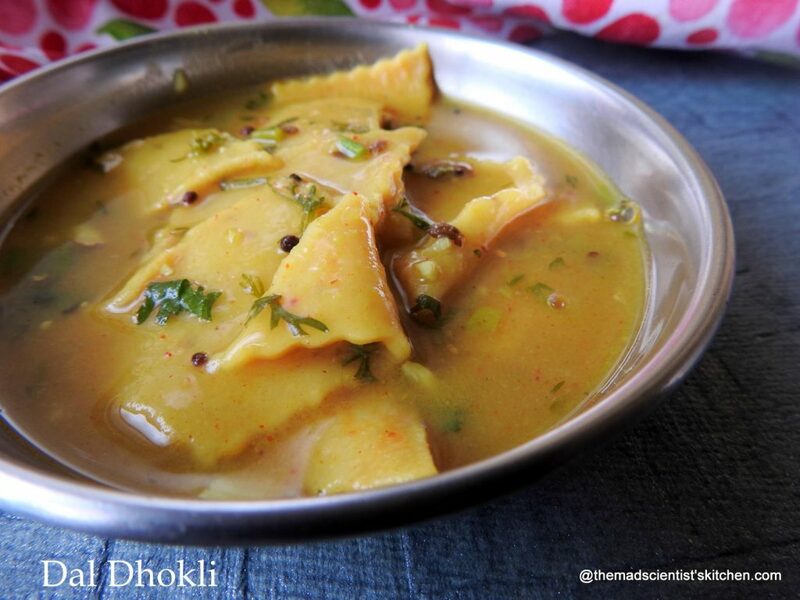 Dal Dhokli is a Gujarati dish made by boiling wheat flour noodles in a pigeon pea stew. In Maharashtra, it is called Varan Phal (Marathi: वरण फळ), or Chakolya (Marathi: चकोल्या). 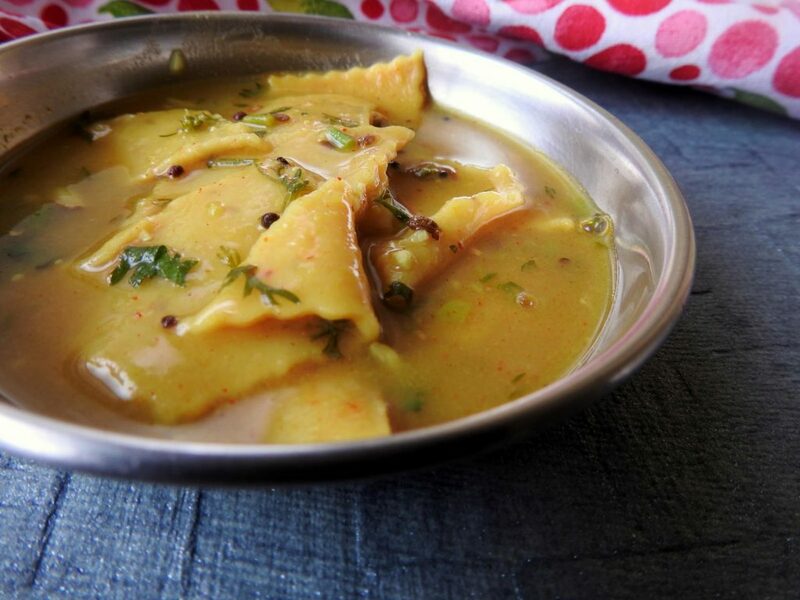 The dish is popular in Marwar region of Rajasthan but the Gujaratis enjoy their Sunday morning meal with Dal Dhokli. Dal Dhokli is a comfort food, sumptuous one-dish meal. The only thing you have to remember is the dhokli needs to be added just before serving else, you have a soggy mess on your hands. Why am I suddenly talking about Dal Dhokli? The reason is for “Ssshhhh Secretly Cooking.” we are cooking Gujarati Food. The twist is that we are paired and we exchange ingredients with our partners. We are to cook with the secret ingredients and the others generally try guessing what the ingredients are. It is fun! This month my partner is Seema Doraiswamy Sriram and we agreed that chilli garlic is best for me while chillies and mustard were with her. I expected her to make a pickle (frankly my brain cells are in a coma right now) but she came up with an amazing dish! Do check out her amazing pictures and recipes. There are quite a few I have bookmarked and plan to try from here started with Inji kichadi. Dal Dhokli is copied from here. Mix all the ingredients in a bowl and knead with water into the dough. I prefer it to be stiff but soft enough to roll out. Keep covered and set aside, say for 15-20 minutes while you get the other ingredients ready. Wash and drain the dal. Pressure cook for 3 whistles and let the steam come down naturally before opening the lid. Mix the cooked dal with water in a deep bowl and blend until smooth using a hand blender. Add more 2½ cups of hot water, add the salt, kokum, lemon juice, jaggery, garlic- ginger-green chilli paste, and chilli powder, curry leaves and turmeric powder, mix well. Cook on a medium flame for 10 to 15 minutes stirring occasionally. Meanwhile, get the tempering ready; heat the ghee and oil in a small pan add mustard seeds and jeera. When they splutter, add the asafoetida, red chillies, cinnamon, cloves and sauté on a medium flame for 30 seconds. Add this tempering to the dal, mix well and cook on a medium flame for 2 to 3 minutes, stirring occasionally. Set aside. Just before serving, boil the dal. Meanwhile, make 5 balls of the dough and roll out into a thin circle using a little whole wheat flour for rolling. Cut each chapati into diamond or square shapes. Add the pieces or dhoklis to the dal one by one. (Else, you will have a big fat lump of dough in the dal. Add coriander and ghee mix well and cook on a medium flame for 1 to 2 minutes, while stirring occasionally. Add more water if the dal thickens while simmering. Linking to Motions and Emotions who is hosting My legume love affair started by Susan page and run by Lisa currently. 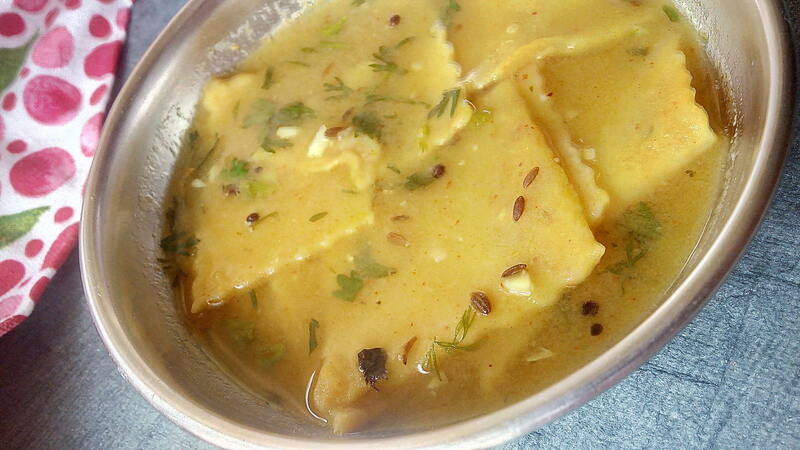 I love dal dhokli.. it is so simple and light. I am drooling right now, had this dish at my friends place long back in my school days, thanks for the lovely recipe will make soon. True Rafeeda just a salad to go with it. One of the most satisfying and filling Gujarati one pot meal. Have you tried with raw peanut oil? Dal dhokli is my all time favorite. I make it at least once every 10 days. Love the way you’ve used a pastry cutter to cut the dhokli. Dal dhokli looks very tempting. I absolutely love Dal Dhokli. There is something about this silky mellow dish that can make my day. Loved the beautiful images and the recipe too. Actually my husband doesnt like Dal Dhokli, else this was on my mind initially when the region was announced. So, maybe next time I should try some of this for myself with a bowl of steamed rice. Vidya in my place the only person who enjoys it is FIL. I eat it but will prefer not to kiddo and hubby make themselves scarce so this is made only for my Father-in law it helps as it is not hard to chew too. This is really such an comfort food and perfect one pot meal. Such a comfort one bowl meal and healthy too ! That’s brilliant, Archana! Our very own pasta dish from Indian subcontinent! I’ve heard of dhoklis but never dared try for fear of making the mess you have mentioned. But you make it sound so doable in your clear instructions. I’m looking forward to try! ???? Maria let me tell you I am the worst roller of rotis and if I can manage it anyone can. Do try it. Filling bowl of protein filled rotis.. kids will love this for the yum yum taste.. Yes Sujita they go crazy over it. Dal dhokli is a simple yet delicious one-pot meal with both protein and carbs in one dish. Looks so tempting. Have heard a lot about Dal dhokli but have not tasted it myself.. so yummy will try soon.. Try Shamila I am sure you will like it. This looks delicious. Cooking wheat flour noodles in pigeon pea stew sounds amazing. Archana, totally would immerse myself in this comforting bowl of dal dokli. superb shar and love the way the pasta style one folds over. must be so soft and delicate. I must thank you Seema for the ingredients and had it not been for the Sambaro (I hope I have it correct here) recipe I would have never thought of this dish which my Father-in-Law loves. Dal dhokli is one of my favourite Gujarati dishes. Yours looks so yumm Archana. I love these dal dhokli made from wheat flour. Looks so so yummilicious !! True Lathiya with our diverse culture we have a treasure trove. One of the classics in Gujrati cuisine. Love it???????? Interesting and tasty dish…….well explained recipe…..
Dal dhokli looks super tempting. Delicious and filling dish. Never tried before. Bookmarking it to try later. The Dal Dhokla looks so yum!Will try this out soon! Dal dhokli looks so good.Comforting meal anytime. I have also made dal dhokli for this month’s challenge and it is a comfort meal for sure ! This one looks so good ! Dal dhokli is such a comforting meal ! 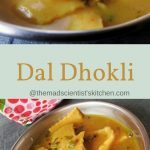 The dal dhokli looks so good ..I have also made the same for this challenge and it is such a comfort meal ! This has to be one of the most temptingly delicious looking dishes I have seen online. I have not tried making most of Gujarati cuisine, and this seems a good place to start! Thank you Sujata Gujarati Cuisine is great you must try it.